As you've been reading, both my sister and I are on edge this week due to our pretty big races we're running this weekend. Lacey is running Shamrock and I'm running NYC. I wanted to do a run down of decisions I have made about the race and some concerns I still have. I did indeed skip my long run this weekend (the only one I skipped this cycle) but I did get out on Monday and got in a few miles before the snow started. 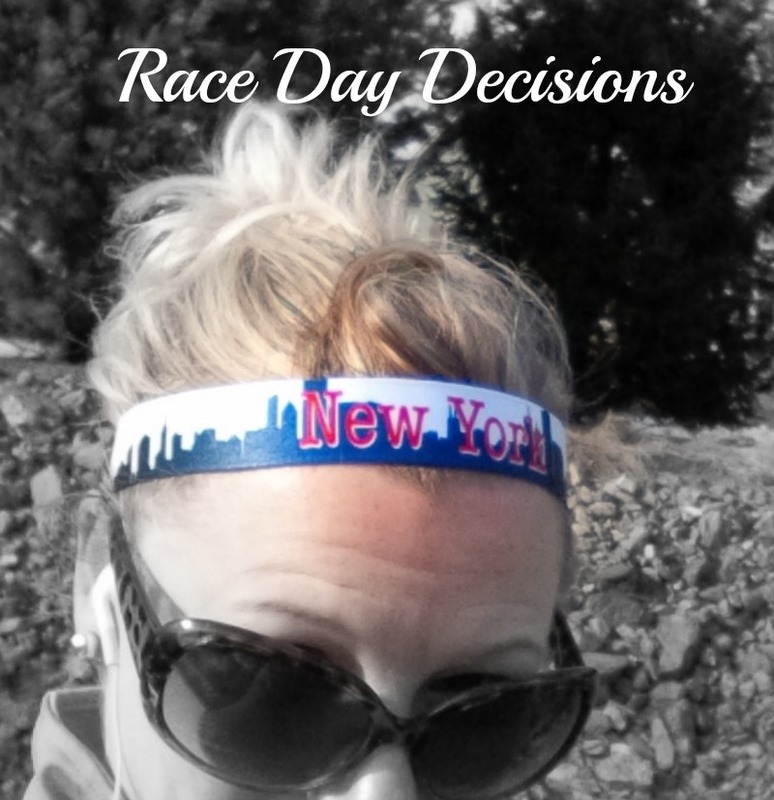 I tested out some of the clothing I planned to wear on race day. I had a long sleeve tech zip up, my throwaway (That I actually got from the Lost and Found at work. Hey they were getting ready to take a pile to Good Will anyway), and my new NYC headband. 1. I've decided not to bring my own water on race day. Using a handheld was out of the question but I was considering using the bottle that goes inside my flip belt. After my run on Monday I realized that because of the layers I plan on wearing I probably won't take the time to dig out my water bottle. For all the more water I usually drink on a run I think the water stops will be just fine. 2. After realizing that I was going to have to wear layers I started stressing out about what I was going to do with my race bib. Do I pin it to my shirt or my jacket? If I pin it to my shirt (with the intention of eventually shedding my jacket), I'd be okay. But what if I decided to keep my jacket on the entire race? I ended up wearing a second layer over top of my bib when I ran Rock n Roll Las Vegas a few years back and because my bib was not visible, I obviously got no race pictures. NYC is going to be a one and done for me so I at least want to have a race picture. My mom advised me on this one and said "Just pin the bib to your race belt". Genius! That was such a simple solution, why hadn't I thought of that? 3. On Sunday I showed a picture of a new outfit that I bought for the race but was doubtful about wearing it. I tried on the short sleeve shirt and that is definitely a no go as it is not a good fit. I'm also going to pass on the pants as well (as cute as they are), because the quality isn't great (They are Avia and a little thinner than the other pants I have), and there are mesh panels on the side of the legs. I think these will be perfect for a race I have in April so I'll save them for that. 4. Like any concerned runner I've been stalking the weather for about a month. I know that does me no good as it would be unlikely the weather forecast would actually stay the same. For weeks now the forecast was a low of 40 and high of 50. NOW it is showing a low of 32 (real feel 34) and high of 38 (real feel 34) for race day morning. There is now a possibility of precipitation. I was never planning on wearing a hat or a visor because I got the NYC headband, but now maybe I think I should. Should I be wearing my windbreaker as well? I've ran in the windbreaker often so I am very comfortable in it. I know many of you are going to advise against this, but with temps in the 30's, I do believe I am going to wear my insulated running tights. I'm wondering if I should wear my insulated top as well? Should I wear the windbreaker over top of the insulated top? I think the 30s can be a little hard to dress for.. I don't think I would go with the insulated tights but I don't think that in the 30s and a chance of precip that you would regret the decision either. I think if you wear the windbreaker an insulated top would be really warm at those temps. but so hard to decide! the possibility of precipitation makes dressing even harder! Good luck! Yea, it's the tops I am struggling with. Maybe a long sleeve top and a wind breaker? I am going to pack all the options and decide Saturday night and re-decide Sunday morning! I will be using a fuel belt outside my layers with my bib pinned to it. We are doing this!! I know, I can't believe it! Thats a great idea to pin your bib to your belt! I hate when the weather is so up in the air before a race, it makes planning ahead so hard! I hadn't thought of bringing my belt because it's not like I need to bring a car key or anything so wearing the belt for my bib just escaped me! Ah the ever changing race weather! It does get breezy there so I might wear a wind breaker w a Goodwin case of rain. I have a lot of friends doing that race. Have a great time! Yea, I am leaning towards wearing the windbreaker. I had trouble figuring out what to do with my bib for this past Saturday's race. Since I wore a vest overtop of my running clothes, and didn't want to risk putting a hole in the vest, I had to come up with an alternative. I wound up pinning my bib onto my thigh, and though I've never run a race with my bib pinned there before, I actually didn't even notice that it was there. That's a good idea too. Did you end up shedding any layers as you ran? I will do that but I still feel that whatever I pick on race day that I will be second guessing myself, know what I mean? That we plan to do too! I normally pin my bib to my pants or my shorts so I can take off layers. I'm not used to running in the 30s, so when I have to (like yesterday with our feels like of 38), I wore an insulated top with a vest over it, neck buff, gloves, ear warmer - and my usual capris/running skirt (my legs don't get as cold). I'd pack everything and decide the night before...the windbreaker sounds like a good option since you're comfortable with wearing it already. My other option is an insulated shirt with a vest which I think would actually be the best option if it does not rain or snow. If it rains or snows than I'd want my windbreaker. But then again the windbreaker may be too much over top the insulated shirt. Oy! Glad you figured out the bib thing - you totally need pics of this!!! Yup, the bib thing is totally figured out! Now I just have to decided everything else. I think I am going to stick with my gut and wear the insulated pants. My question for the insulated tights would be do your legs get cold during races? If they heat up, would you be OK with being warm for the race? My legs are usually fine, but if it's chilly, I need to bundle up my upper body, and my vest is great for that. Get a layer close to my torso to keep that warm. Good questions. I've worn those tights before in similar Temps and even a little warmer and i've been okay. My issue is with my arms being cold. That's why i'm leaning more towards the jacket than the vest. Oh goodness too many decisions. Sometimes the 30's are the best temps to race in especially if its not windy. If it is a winsbreaker and of course something to easily cover your mouth and nose is ideal. I've actually found if you dress right you'll still enjoy and have a great race no matter the conditions. Good luck this weekend and have fun with it! For Temps in the 30's, what would you suggest to wear under the windbreaker? I hope so. Thanks Karen. Can you think of a run you did in similar weather? What did you wear? Were you comfortable? I would say yes to the windbreaker, but only if you are ok with parting ways with it if it gets too warm. I have this one windbreaker that I have ditched (and found again) twice, and I'm always glad to find it again. I would wear a thicker shirt under the windbreaker, but a lined one if you think it's possible you would toss it. 32 is still cold enough to need layers for me. You got this!! I can't wait to see how you do! I'm super excited for you! I log all my runs and I record the Temps too(which I get from my Garmin). But for some reason my Garmin has not been showing the temperature and I haven't done any other runs this year in less than 41 degrees. If it's going to be in the 30's and breezy, wear the windbreaker too. You can always tie it around your waist if need be. Yes to a visor or hat, as long as it's one that stays on. Race belts are game changers. I can't remember the last time I actually pinned on a bib. Have a great race and enjoy! I"m the worst about over dressing for cold running weather, so I'm not sure! That does sound pretty cold and windy though... and if there is really good chance of rain I'd DEF do a visor. I don't like the full hat b/c my head gets hot! Oh man, so much thought has to go into clothing when you race up north in the winter/spring!! I'm glad your mom helped you figure out the bib situation! If it's windy, I'd guess wearing the windbreaker would be a good idea. Can you get a cheap throwaway shirt in case you want to wear something at the start and shed it later?